I promised a few months ago that I’d do a follow up article on external hard drives. The result? The complete guide to external hard drives for creatives – a guide made for the least technical to understand, yet comprehensive enough that you’ll know what you need. Broken up into two parts, today you will learn what specifications to look for and the options you have to you. Not all options are equal and some are even [effectively] useless to most creatives. Remember there are two ways to obtain an external hard drive; buying a packaged one, or making your own with a hard drive and dock / enclosure. This guide will prove useful in specifications you’ll want for both! Rotations per minute or RPM (as listed on spec sheets), is the amount of times the disks inside of the drive can rotate in a minute. What does this actually mean? Well on a traditional hard drive data is scattered on compartments on the disk. So the faster the disk spins the faster it can access it. 7,200 RPM is the minimum I would ever go for a hard drive. It’s not going to be as fast as other options, but it’ll give you a good bang for your buck in terms of reliability and speed. A whole lot more expensive, but for a faster speed. While it’s debatable if the cost is worth the speed bump, you need to be wary of 10,000 RPM drives. Since the disk spins so fast they are notorious for breaking faster than usual. While it’s not my first choice, if you have a good back up system and need speed but can’t afford an SSD (more on that in a second), I’d go for it. Although 7,200 RPM would be acceptable for most creative endeavors. SSDs are a completely different breed of hard drive. Basically a SSD has no moving parts because it is made using flash memory, which means that the drives are much faster and more reliable. The only real downside to having an SSD is that they’re a tad expensive and currently top out at 1 TB. While it is expensive, I’ve found them to be extremely worth my time and money. 5,400 RPM is mostly outdated, but it still lurks around in low-end external hard drive packages. Why? It’s cheap. Why avoid it? It’s far too slow for creatives data moving through external connection (or internal). Stick to a speed listed above and you’ll be much happier. Your disk space is a pretty basic concept, more is better. How much do you need? We’ll lets put it this way. A typical MP3 is about 4 MB (megabytes). There are 1000 MB in every 1 GB (gigabytes) and 1000 GB in every 1 TB (terabyte). How much you’ll actually need depends on the amount of files you plan to put on it, but for most 1 TB is sufficient and pretty much standard for all 7,200 RPM drives now-a-days. If you choose to go the SSD route (if you want speed, you’ll want to), I’d got for a 500 GB as it’s more cost effective than 1 TB at this time. Form factor refers to the physical thickness of the hard drive, which determines mobility and requirements of power. 2.5” drives are common in laptops and SSDs. The benefits of a small drive is smaller space in your bag and [usually] no external power requirements. You do have to watch out though – 5400 RPM is frequently seen in this form factor! Most common in desktops, 3.5” drives are much bigger in comparison. Also most 3.5” external hard drives require some type of external power outlet connection (a simple plug to the wall). If you’re working in a studio or a static place this isn’t a problem – even light travelers wouldn’t mind. If you’re always on the road though you may want to invest in a 2.5” instead. There are tons of connectivity options and I’m going to label them in the order that’s fastest to least. Remember not all computers have every type of connection so definitely check your computer to see what the fastest connection you have is. Remember your external hard drive is only as fast as your connectivity! By far the fastest and best connectivity I’ve ever used, though it’s also the rarest. There is only a handful of non-Apple computer I’ve heard of having Thunderbolt, but if you have an Apple or Thunderbolt compatible computer you’ll want to use this. Yes an enclosure or dock will be a bit expensive, but it’ll be the best money you ever spend on an external hard drive – I promise. Both eSATA and USB 3.0 (one below) are debatable of which is faster. On paper USB 3 is supposed to be faster, but in real world usage they’re about even. eSATA is based off the technology that connects your hard drives inside of your actual computer, so you know it’s fast. This option is more seen in desktops than laptops. USB 3.0 is a relatively new option based off of the most common connectivity in the world, USB (2.0). The newer version has built on to the old technology making it faster by using features like SuperSpeed. If you have an older computer, it’s most likely you don’t have this, but desktop users can actually get a PCI Express card to support the connectivity. There are a few versions of FireWire, but the only one that still matters is FireWire 800. If your computer has an older version of FireWire it may be time for an upgrade. FireWire 800 is common on most Apple computers in recent years and definitely the lowest speed I’d go for creatives. I’m 99% sure your computer has a USB 2.0 connection. In fact is probably has several. Though if you’re using an external hard drive to house your projects or files you’re working with, I’m sure you don’t want to use it. It’s very slow compared to any other options available. If you have another connection avoid USB for this purpose. Note: If you want to use an SSD for your external hard drive you’ll want either Thunderbolt, eSATA, or USB 3. Anything slower will blow the speed benefits of an SSD externally. These features aren’t necessities, but some creatives might actually require or fancy them for whatever reason. Many may not even know such features exist in external hard drives. Unlike Dropbox or iCloud, these external hard drives work off of your router to create your own personal cloud. This is extremely useful if you work with more than one computer (or person) and don’t completely trust the cloud of big companies. Some external hard drives come with drivers / software that allow you to automatically back up your data at certain times. While this isn’t exactly geared towards creatives specifically, it’s very useful if you need a back up method. Also I should note that Mac OS X has a back up feature built-in (Time Machine) that will work with any hard drive too. Without getting too complicated, RAID is a feature that allows multiple drives to act as one in a number of different ways depending on the configuration. Some configurations can add speed boosts while others are a backup failsafe. For the technologically advanced you can check out more on RAID through Wikipedia. This is probably the rarest of all features, in fact I only have heard of a handful of drives with this function. Basically instead of having to burn out .ISO files (disc image files – DVDs, programs, etc.) on to a blank DVD, these clever externals can act as a disc. It’s a really amazing time and money saver if you own a lot of software! Stay turned for part two next week, which will include all sorts of recommendations for hard drives, docks, enclosures, and complete packages. 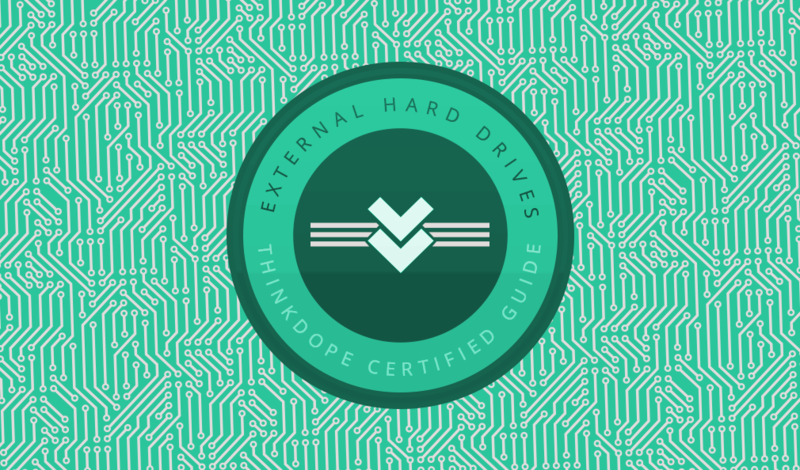 What would you like to add to the complete guide to external hard drives for creatives? Let me know below!